Fynbos enjoy full sun and won’t grow well in damp or humid areas. While fynbos plants are fairly drought-tolerant, they need to be well-established before they can tolerate long, dry periods. Take care to keep the soil of just-planted fynbos plants moist, but not waterlogged, by watering 2-3 times a week. Once the plants are established, watering can be reduced to once a week. The good news for busy gardeners is that fynbos has adapted its root systems to thrive in relatively nutrient-poor soil. Ensure the soil has good drainage. Chemical fertilisers containing phosphorus will damage your fynbos plants, so feed it with a slow release, organic fertiliser. Potassium and phosphorus hinders the growth of fynbos plants, so avoid feeding them with mushroom compost, bonemeal or any kind of manure. If your garden has slightly acidic soil (a pH of 5 to 6 is ideal) that drains well, you can plant most varieties in your fynbos garden. Mulch around the plants with straw, bark or leaves to keep the soil cool and to discourage weeds from taking over. Once your fynbos garden is well-established, prune every year after it has completed flowering. 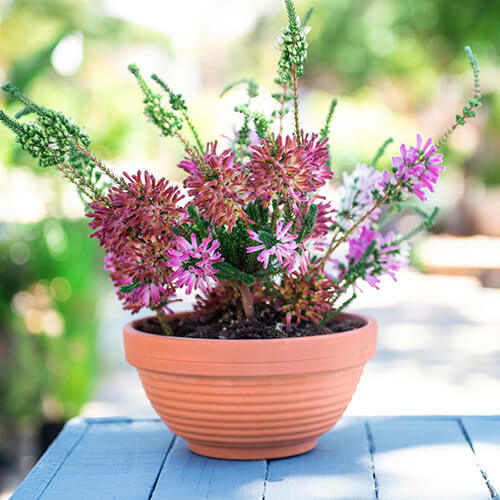 If you’re planting a fynbos plant from a pot into the ground, avoid disturbing its roots as their root systems are sensitive.